It is really easy to book your self catering holiday accommodation with us at Our Bench Self Catering Holidays. Choose which cottage you would like to stay in and then have a look at the availability link for each cottage. Check the cottage is suitable for your needs - you may like to read the access statement - they are different for each cottage. Read our terms and conditions and make sure you are happy to agree them, booking with us means that you agree to these conditions. You can provisionally reserve your holiday dates over the phone or by email, but it is easier to book directly Online. To confirm your booking we must received a completed booking form and your deposit within 7 days. 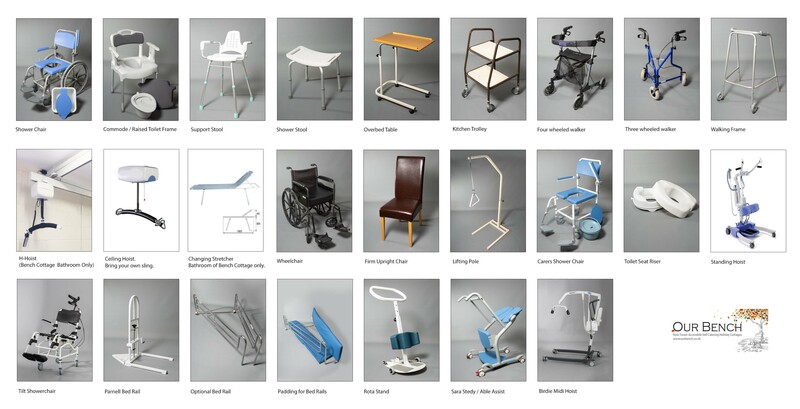 Have a look at the specialist equipment we have available, once your deposit is received - we can confirm your equipment at the same time don't forget to book any extra services you may require, carers, companions etc. If you are staying in "Garden Bench" please be aware that this property occasionally takes well behaved pets. Decide whether you need to arrange Travel Insurance - we recommend you do. We are able to offer short breaks and weekends during our low season - from November to the week before Easter (excluding Christmas and New Year) for a 3 night long weekend (Fri, Sat and Sun) or a 4 night mini break. Short Break and Weekends during the peak season March to October, may be available last minute and can only be booked up to 4 weeks prior to the start of the holiday - with full payment confirming the booking. For our last minute vacancies please follow us on facebook. Download booking form for bookings by post, please confirm dates by phone first. Additional Booking Form for Guests and Equipment Requests - to be completed for every booking. Our terms and conditions for your reference. Access statement for Bench Cottage, Little Bench and Garden Bench - please note they are all different - each cottage is unique. Pets Booking form for Garden Bench if not booked Online. Data Protection - We promise not to sell or use your information, we will however keep your booking details on record in case you come back and revisit, and we may from time to time contact you via your email address after your stay to remind you to come and visit again and to tell you of any offers, you are welcome to unsubscribe at any time or request we remove your details. Payment reminders, additional information, welcome letters and directions are usually sent by email. Please make sure this is upto date. Lymington New Forest Hospital, Wellworthy Road, SO41 8QD, Open 8am - 9pm. Appointments bookable by calling NHS 111. They treat minor injuries and minor illnesses and will be available from 8am – 9pm (including Bank Holidays). Accessible Equipment - We have a large range of equipment to make your stay easier - this is not stored on the premises and is booked on a first come first served basis. If you need extra equipment that we are unable to supply - you are welcome to hire it and have it delivered to the cottages on the Friday prior to your arrival between 10am and 1pm. Our Bench has a Bed Bumpers Set availabel for use with the profiling bed. This pair of Bed Bumpers has been designed to fit over the top of existing bed rails to provide both softness and a feeling of warmth. The bumpers are made from high-density foam and have protective waterproof covers that are easy to clean. One pair of Bed Bumpers, Fit on bed sides and bed head rails, Bumper length: 2030mm (80") Bumper depth: 25mm (1") Bumper height: 330mm (13") These are available to hire for the week during your stay subject to availabilty for a small additional of £25 per week. Please contact us for details. Photo available here. Mary has a Standing Hoist / Stand Aid available to hire, this is in a "as new condition" and is available for an additional fee of £50 per week whilst staying at the cottage. You will need to bring your on standing sling with you. Please contact us for details. Dorset Nursing Supplies are also happy to assist with specialist equipment and are able to deliver it prior to your arrival. Don't forget to mention you are staying with us and they will do their best to help. They can be contacted on 01202 425070. Their hire equipment includes (but is not limited too: Stand Aid, Dynamic Mattress Overlays, Scooters, standing hoists etc). Winton Health Care Solutions - hire equipment includes full replacement mattress (high risk), overlay mattress med to high risk) and additional profiling beds. Horizon Mobility - this national company offers a variety of equipment to hire - products include wheelchairs, hand-bikes, scooters, lift and tilt shower chairs, tilt & recline shower chairs, air flow mattresses. You can order direct through their web site, or through the phone, and they reguarily deliver their equipment to the Lymington area on a Friday - so ideal - as it can be here for your arrival and can be collected on your departure day. A local company, Richen's Care is able to hire out a range of additional equipment for the duration of your holiday - it can be delivered to the cottage prior to your arrival and collected on the day of your departure. You can contact Richens Care on 01425 638006 direct to arrange the hire (mention you are staying with us) and they will do their best to help. Ableworld based in Bournemouth are also scooter hire - there is a delivery/collection fee to the cottages, daily and weekend rates are available. Ableworld has a 3500 sq ft store in Kinson near Bournemouth. They can sometimes offer a late service - arrange your scooter hire by Wednesday prior to your arrival and they can deliver it on the Friday. Dialysis machines - we have had different guests use the following services - Milford War Memorial Hospital - 01590 644135, Totton - 02380 660195 or Wessex Renal Unit 02392 0286000. Dolby Vivisol is the home Oxygen Service for this area, and should be able to arrange delivery for you if required. Mobility Equipment Direct - a national company who are able to provide a range of equipment from pressure relief mattress hire, alternative profiling beds, additional riser recliner chairs and more. Gallagher Mobility Aids - Southampton and Christchurch company who hire manual wheelchairs, electric scooters and electric wheelchairs. If you require anything else then please ask - we know that everyone has different needs and we will be happy to help if we can or recommend a company who can assist. To make your stay easier you may like to make arrangements with a private care agency. Please contact and book with them direct, as they can then ensure they provide the service that you require, one of the best places to search for the right care is through the United Kingdom Homecare Association - you can search via location - please use the postcode S041 8HH for the most up to date list of carers available. United Kingdom Homecare Association Ltd (UKHCA) is the professional association of home care providers from the independent, voluntary, not-for-profit and statutory sectors. UKHCA helps organisations that provide social care (also known as domiciliary care or homecare), which may include nursing services, to people in their own homes, promoting high standards of care and providing representation with national and regional policy-makers and regulators, but due to the demand for care in the New Forest - it is essential to confirm your carers availability before you confirm your holiday dates. Guests staying at Our Bench Self Catering Cottages have been pleased with the care they have received from the following companies, who are familiar with the cottages - although you are welcome to choose your own. 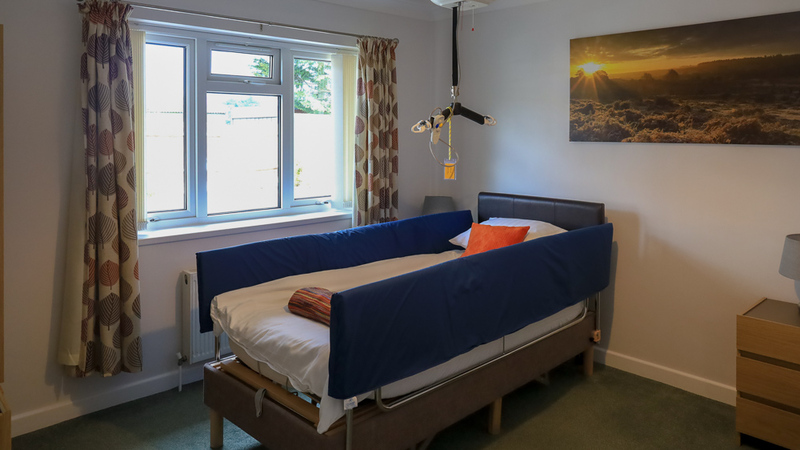 Oakhaven care provides sensitive and personalised care originally to patients at Oakhaven Hospice in Lymington, now they are able to care for people in their own home or staying in our holiday cottages and with all profits being ploughed back into the local hospice. The team would be delighted to help guests with personal care, assistance getting up and going to bed, washing and dressing etc. For more details visit: www.oakhavencare.co.uk or call 01590 646440. Bluebird Care has an office in Lymington are able to respite care, give them a call to discuss your needs. Forest Care - Home Care Services in New Milton who can be contacted at homecare@thecontemplationgroup.co.uk or call 01425 620906. Order your shopping for the week online and have it delivered to the cottage on the Friday prior to your arrival between 10am and 1pm and we will put it in the kitchen for you so that everything is easy to find when you arrive. If you have arranged to have the shopping delivered please let us know so we can expect it. Accessible Transport based in Pennington - acctrans.co.uk - advance booking required... they offer a more personalised service for disabled guests.